Reporting is a very useful feature which can be used creatively to access knowledge quickly and/or manage progress of work within maps in addition to the Pro Text Search capabilities. You can run and store one report per FREE space and up to ten reports per PRO space per each user. To run a report, click on the report icon in the upper-right menu. You will see the list of your active reports (up to four). To run a new report, click "Add new report" at the bottom. To see all of your active reports in every space, click "Show all reports". 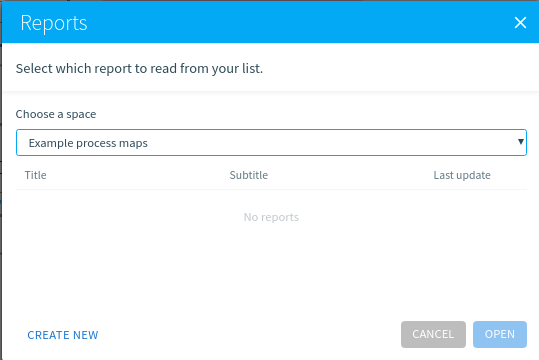 Even if you can't run a report, you can always access the ones you already generated. If you are on a FREE space and you generate another report, it overwrites the previously generated report in that space. If you are on a PRO space, a new report will overwrite the old one if there are more than ten reports in that space. Reporting may be affected by group visibility settings on attachments & links. Please see this article for more information. The report runs in the background, and when it is finished you will get a notification. To see all your reports in all your spaces, click on the report icon and select "Show all reports". 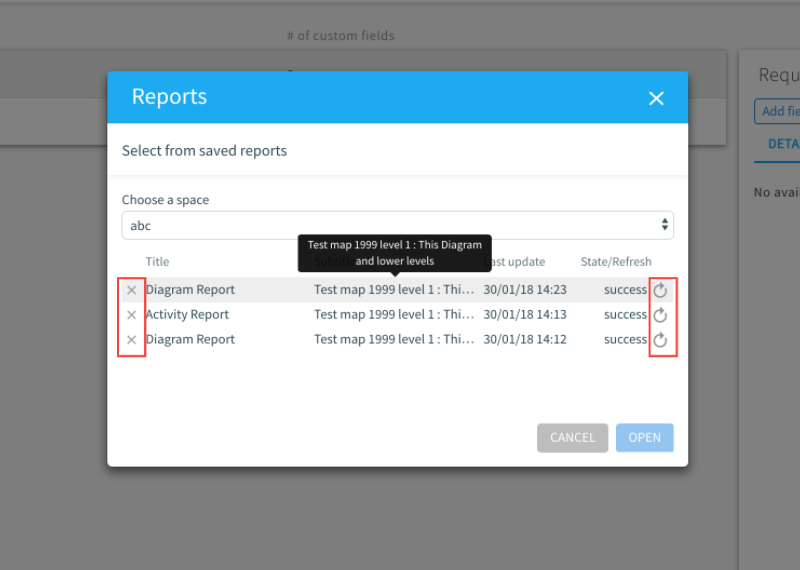 You can choose the space and select which previously generated report you wish to open. You can refresh previously generated reports to include the new data. The report will be re-run with the same parameters (report type, item, scope, filters etc.) and it will include any new data added since the last time the report has been generated. You can also remove a report from the list to clear your list of stored reports. Reporting when combined with data tables is a cornerstone of business analysis with Elements, since you can apply a template of a Data Table to any number of activities and then report and filter against specific attributes and fields that are of interest to your current analysis activities. If you want a broader understanding of business analysis using this approach, see this free eBook. While primarily focused on Salesforce Admins, the principles and approaches apply to anyone looking to use Elements for business analysis. You initiate a report from a diagram, as the report will run for “this diagram” or “this diagram and lower levels”. There are a couple of reports that are only available for Salesforce Ref models. Click here to learn more about them.